ViewSonic’s VP2770-LED is very much an upmarket monitor, even if it’s not aimed at the silly money graphic arts set. It’s a 27m iPS screen with 2560 x 1440 resolution, meaning it has 20% more workspace than a typical 1920 x 1080 panel. While text can look rather jagged on a 1920 x 1080 screen this large, things are much smoother at the VP2770-LED’s resolution. The abundance of pixels also means it’s simple to work on two documents side by side, and it’s perfect for using applications with multiple toolbars and windows. There are VGA, DVI, HDMI and display-Port inputs, so a Mini displayport adaptor is the natural way to hook up to your Mac. It also has a built-in hub with two USB and two USB 3 ports. The screen is also highly adjustable: you can use it in portrait and landscape modes, tilt it towards or away from you, or pivot it from left to right. Further, you can raise the base of the screen from 88mm all the way to 242mm, so you should be able to get comfortable no matter how tall you are. The only real drawback of the design is that the three-legged stand measures an enormous 518 x 418mm from leg tip to leg tip, so takes up an awful lot of your desk. While text can look rather jagged on a 1920 x 1080 screen this large, things are much smoother at the VP2770-LED’s resolution. We were initially disappointed with the results of our calibration tests. Out of the box, the VP2770-LED only came within 93% of the sRGB colour gamut, and the colour gamut diagram generated by our dispcalGUl calibration software showed the monitor struggling at its native Natural settings to display enough red and green to satisfy the sRGB standard. The display also has an sRGB mode, but this was much too dark, and there’s no way to change the brightness level when the screen is set to sRGB. however, once we set the screen to User mode and ran our calibration process using a Spyder4Express colorimeter, the software reported a much-improved 99% of sRGB colour gamut. We were initially disappointed with the results of our calibration tests. When viewing our test images, we struggled to find fault with the ‘P2770-LED. Large areas of colour were vibrant and uniform across the display, and it showed all the detail we could hope for in both light and dark areas of our test pictures. Better still, the screen’s matt finish also means it hardly suffers from reflections from overhead light sources. 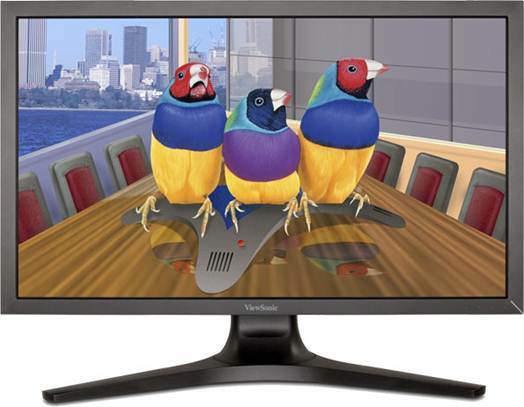 ViewSonic’s VP2770-LED is a feature packed and highly adjustable monitor, with superb picture quality once you’ve calibrated it. It doesn’t have the best colour accuracy out of the box, so we’d recommend you invest in a colour calibrator, but if you’re prepared to do this, it’s a great buy. However, if you can do without the USB hub and screen pivot and want better colour accuracy out of the box, we’d recommend saving $150 and buying the Asus PB278Q.